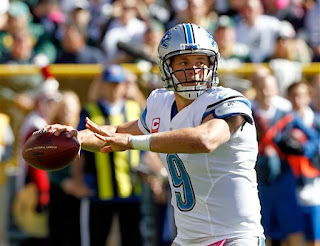 Let’s take one last look at the Lions’ 22-9 loss to the Packers on Sunday. — Matthew Stafford spread the ball out connecting with eight different players for 25 catches — two tight ends, two running backs and four wide receivers. — Wide receiver Kris Durham had the most targets (eight) and finished with three catches for 30 yards including a 13-yard touchdown catch. — Louis Delmas played 100 percent of the defensive snaps for the fourth out of five games. He missed two snaps in the loss at Arizona. Delmas rarely practices trying to keep his left knee ready for Sundays. Apparently the plan is working. — Rookie tight end Joe Fauria was on the field for nine offensive snaps and two on special teams. It was his second straight week without a catch. He has four catches this season — two of those were touchdowns. — Chris Houston (hamstring) and Glover Quin (ankle) were questionable to play Sunday and each of them played 100 percent of the defensive snaps. — Rookie defensive end Ziggy Ansah had the Lions’ lone sack which brings him to 3.5 sacks for his first five NFL games. He had had two tackles and a forced fumble. — Linebacker DeAndre Levy had a huge game and the numbers back him up. He led all Lions with 14 tackles and had a pass defense. He was on the field for every defensive snap. — Defensive tackles Ndamukong Suh had four tackles while Nick Fairley had one. We all know numbers don’t tell the whole story especially on the defensive line. — The Lions were 47-percent efficient on third downs, but allowed the Packers to convert on 44 percent of their third-down chances. — Too bad the Lions’ offense made it to the red zone just once because they were 100 percent efficient, while the Packers were 0-for-2 in red zone efficiency. — Rookie Sam Martin continued to excel with six punts averaging 51.8 yards. His net punting average was 42.8 yards. — The Lions had seven penalties for 50 yards while the Packers had 10 for 72 yards.